This means that now is most certainly the time to be extra cautious to possible hazardous conditions when on the roads and motorways. 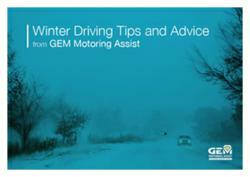 GEM Motoring Assist (http://www.motoringassist.com) has created a free downloadable guide that is an advice manual for driving during the winter months. Amongst the many things the manual will include it will also contain important advice in the event of a breakdown, tips for when driving in the snow and a handy travel checklist.